Daw Aung San Suu Kyi is the chairperson of the National League for Democracy (NLD) in Myanmar, as well as a Nobel Peace Prize Laureate. For years she has been an outspoken leader of Burmese opposition. She spent almost 15 years under house arrest for her struggle for freedom and democracy in Myanmar. In 2012 as part of the firs free by-elections she became a member of the parliament. Since then she has been playing an increasingly influential role in the transition process going on in Myanmar. 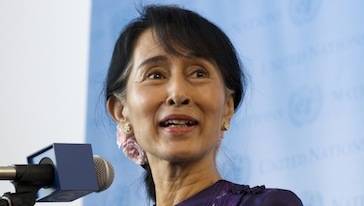 Aung San Suu Kyi is ranked #1 among the 2012 Top Global Thinkers by the Foreign Policy.